Back in 2008, Infiniti set the pace for a new breed of compact luxury crossovers with the EX35. Essentially keeping all the virtues of the stellar G35 sedan, the EX, with its jacked up suspension and extra cargo room, quickly became an instant hit among luxury sport utility customers who demanded something more compact, nimble and, most importantly, sporty. Today, every carmaker has copied this formula to the point where it has become one of the most popular segments in the automotive industry. That being said, Infiniti felt the timing was right to update their compact luxury crossover in an attempt to reclaim the segment it created. For 2016, we now get the same Q (confusing) naming scheme as with the rest of their lineup, so the EX37 is now the QX50. It may have a new name and new front and rear bumpers, but underneath this luxurious truckish wagon of a thing with a sloping roofline is still the same proven, and honestly superb FM platform; the same platform used for the Nissan 370Z sports car. This means that the 2016 Infiniti QX50 AWD first sends the power to its rear wheels before deciding where to send it next. Behind the wheel, it all translates to sports car-like handling characteristics, with rather athletic road manners and a willingness to be driven hard. If you’re a good enough driver, you can even drift it. In the bends, this thing grips to the road like the best sports car out there, which makes sense, because it uses the same traction system as the all conquering Nissan GT-R super car. Indeed, among the sea of wagon-like SUV’s, this is, without a doubt, a sport utility vehicle. Same goes for the drivetrain. Instead of adopting the current trend of turbocharged 4-cylinder engines, Infiniti decided to stay with their proven 3.7 liter V6, the famous VQ37. It’s good for an impressive 325 hp and 267 lb-ft of torque, giving the QX50 a rather large power advantage over its competition. And boy does it fly. Even with 1827 kg to carry around, the 2016 Infiniti QX50 has no trouble getting off the line. 0 to 100 km/h comes in a respectfully swift 5.7 seconds, sounding, well frankly pretty awesome while doing so. The sound of that VQ just never gets old. All that power is managed by a 7-speed automatic transmission with sport and manual modes which, although sometimes hesitating to find the proper gear, shifts smoothly and maintains the revs high when you need them the most. My favorite driving method was in DS mode, which is essentially sport mode with the automatic transmission doing its own thing. Unfortunately, there are no paddle shifters. Now, while many will argue a V6 is not a good idea for fuel economy, I can assure you that it doesn’t make a difference. During my test drive, when driven normally, the 2016 Infiniti QX50’s trip computer displayed an average fuel consumption of 7.5 liters /100 km. Not bad for a crossover that can leave most sports cars in the dust. To address customer feedback regarding rear leg room, Infiniti have considerably lengthened the 2016 Infiniti QX50’s wheelbase by a full 8 cm. The result is a considerably roomier rear seat area with more than ample legroom thanks to a flat floor. The longer track, according to Infiniti, also increases the vehicle’s stability in slippery conditions, something Canadians will no doubt appreciate. Sadly though, because of its slopping roofline, the 2016 Infiniti QX50 still suffers from a rather tiny trunk area. I guess that’s the price to pay when you favor performance over utility. Inside, we’re presented to an updated version of the EX’s interior rather than Infiniti’s new design language found in the Q50 sedan. It’s still a very luxurious and attractive place to be, with sumptuous leather seats, high-quality materials, and exquisite fit and finish, but I would have enjoyed the Q50’s more modern, youthful, and attractive interior. Same goes for the infotainment system. Don’t get me wrong, it works fabulously well and is rather intuitive to operate, but feels somewhat dated compared to other luxury-grade vehicles on the market. Like, I don’t know, the Q50’s touchscreen system maybe? Hello Infiniti. The 2016 Infiniti QX50 also comes with an array of seriously high-tech gear. My tester, equipped with the only three optional packages, had pretty much all the tech available in today’s automotive market: adaptive cruise control with lane departure warning, blind spot monitoring, collision avoidance, a back-up camera, a bitchin’ Bose 11-speaker sound system, navigation, Bluetooth audio streaming capabilities, and parking assist; a system that uses three cameras around the car to assist the driver with parallel parking. Now that’s what you call fully equipped. The 2016 Infiniti QX50’s ace up its sleeve lies in its value. At an entry price of $37,900, nothing matches its performance credentials and available tech in that price range. Its direct German competitor, the BMW X1, starts at $38,800 with only 228 hp, almost 100 less than the Infiniti. Although remaining a bit rough around the edges compared to its German rivals, the 2016 Infiniti QX50 remains a rather intriguing product. Consider the fact that the only vehicle that comes close to its performance is the $60,000 Porsche Macan, and the QX50 suddenly becomes quite a bargain. 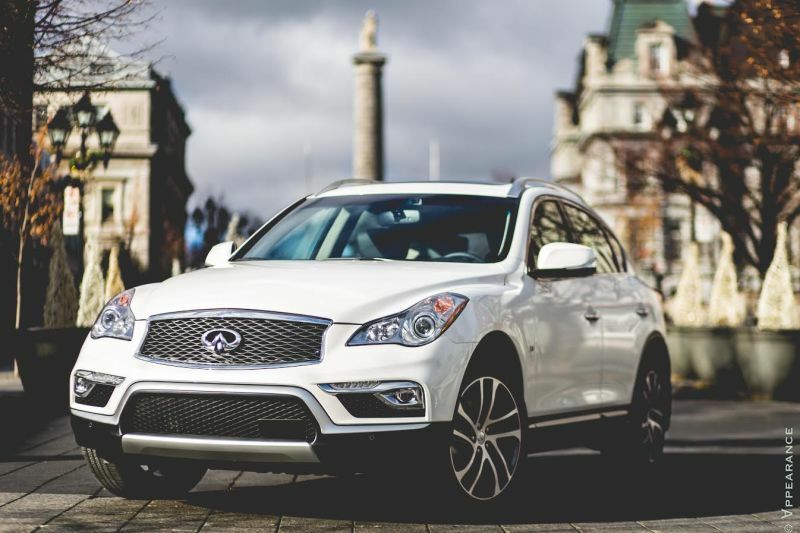 That being said, if what you’re after is a luxury sport utility vehicle that favors dynamic driving characteristics over minivan-like cargo room, then the 2016 Infiniti QX50 is definitely worth a shot. The 2017 Infiniti Q60 is finally here!